I have the pro 3.1 and some strange things that I can’t figure out. It is specific to costco because the item number is there, etc. So why does it show up in other lists, I, as stated above, never checked it off for other stores. 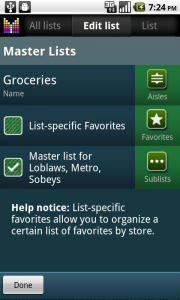 The “+1″ in favorites means that the item is present on your other list such as shopping list or pantry. If you tap the List field you can see a checkbox next to the list the item is in. 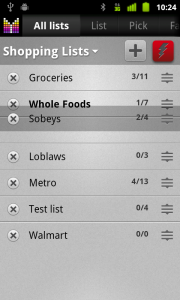 I wish that todo lists could specify a master list like you can with grocery lists. I.e. you could have a master list called todo, then sub lists Monday, Tuesday,…. When you view the todo list you would see all to do items for the week. 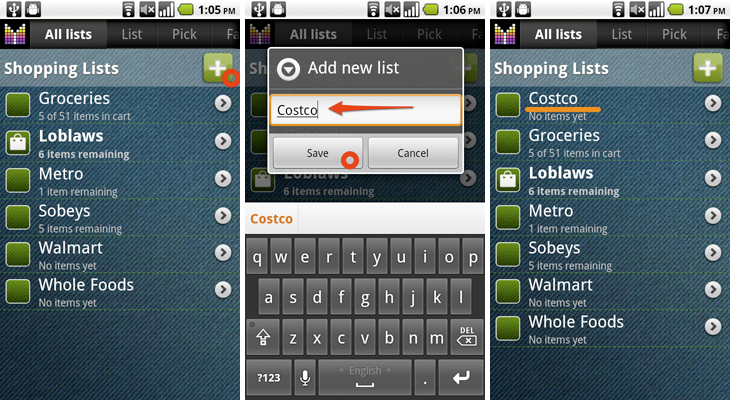 Hopefully this would not be hard to implement if you could reuse the code from the grocery list section. It would also be nice if you could edit the list order. Other lists allow it like recipe lists. One last WAY OUT THERE wish list item. It would be so great to be able to post menus to a calendar (Google or ical) so family members can see it without having to go into MG.
Love this app. 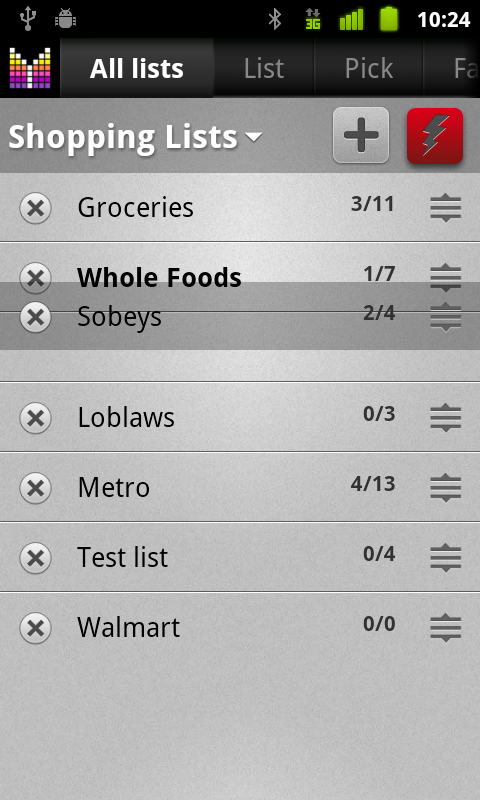 LOVE the menu planner and how easy it is to create your grocery list as you plan your menu. Love the pantry lists too. Dorothy, thanks so much for your feedback. We will consider your suggestions going forward. As for list sorting, do you mean sorting sub-lists within super lists (former master lists)? It is possible to re-order lists under All lists section. I Just Looked At My “To Do” List, To chec Off Some Things I Got Done. The List Is Empty. DoTheThings You Put On The List Only Stay There A Couple Days? Or Am I Doing Something Wrong? Thank You. The App Is Great Though. Marianne, thanks for contacting us. The items on the ToDo list should stay as long as you want. They should not disappear unless you delete them or choose “Delete completed” after you tap Side Menu button. 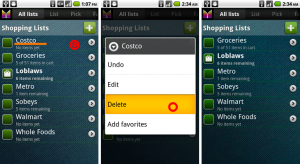 Could it be that you created multiple ToDo lists and then switched between them? ThankYou. More Than Likely I SomehowDeleted It. I’ll Keep A Close eye On That. This Is A Great App And You Guys Are Doing A Great Job. ThanK You. Marianne, thanks a lot for your feedback! Feel free to contact us again with any questions or comments. I just purchased the full version, read through the User Guide and comments, and began in-putting my items. I created three separate shopping lists in “all lists” for the stores I use regularly; and then went to the “favorites” tab to create a complete list to use to pull my weekly list from, as suggested. However, I noticed that I am getting duplicates of some items in my lists. For example, I added bird seed to my favorites and then added some details including what shopping lists I wanted it to appear in. Later, when I looked at one of my specific shopping lists, the item was there twice and no longer had the aisle name I had previously assigned to it. I went back to check my favorites and everything was correct there, and was only listed once. What am I doing to cause this duplication? Thank you for your help. Hi Leigh, thank you for your feedback. Unfortunately, it’s hard to say what exactly is causing duplication. Just be aware that item is uniquely identified by Name + Details, and the app may also add new record to shopping list if units do not match. I LOVE this app! Two ?’s or you. 1. I am using this app on a Acer tablet, are there any concerns I should have by not using a smart phone? 2. I read ALOT. I yet my books by reserving them at my library and I keep a list of ones read and those still due in. Can I use this app for that? When I receive a book I would tap it and would it go into history. But would all those hundreds of books go on my other shopping lists. FYI I am using the to do list for something already. Hi Mary, I appreciate your feedback. 1. The app should be fine on any Android device with Android OS 2.3+. 2. Don’t see any reason why the app won’t work for tracking books. Just try on a subset of 5-8 books to see if you get an expected behavior. Hi Debbie, thanks for your feedback! Yes, we plan on providing coupons going forward, however there’re no specifics yet. As for adding items to your Pantry, yes, products can be added and updated in your Pantry on checkout. Please see Pantry User’s Guide for more details. How can I add my own “aisle” names to the list of aisle choices? Otherwise, love the app! Kate, you can customize aisles under Menu > Settings > Aisles. Please see Manage aisles User’s Guide for more details. Alex, I have read in several of your posts the comment: “We plan some improvements with Master lists & multiple store assignment of products in one of the upcoming updates.” Were the changes in version 3 (IE. Generic Names) the improvements you were speaking of, or is this update still to come? Thanks for a great and well thought-out product. Doug, thanks a lot for your feedback. Unfortunately, Master list and multiple list assignment improvements are yet to come. Please keep your eye on the What’s new page to see when the enhancement is available. OK. I have set a favorites for a list. Works great. But those same items are in another lists favorites. I’m afraid to delete them thinking they will be removed from the original list. John, by default all lists use the same Favorites. If you’d like per-list favorites, just enable “List-specific Favorites” option in you shopping list. For more details please see List-specific Favorites. Please let me know if you need any further assistance. Keep up the great work, be happy to buy film version when first item I listed is possible. Mauri, thanks for your feedback. Regarding your 1st suggestion, you may consider Favorites as the list of items you usually buy from a store. 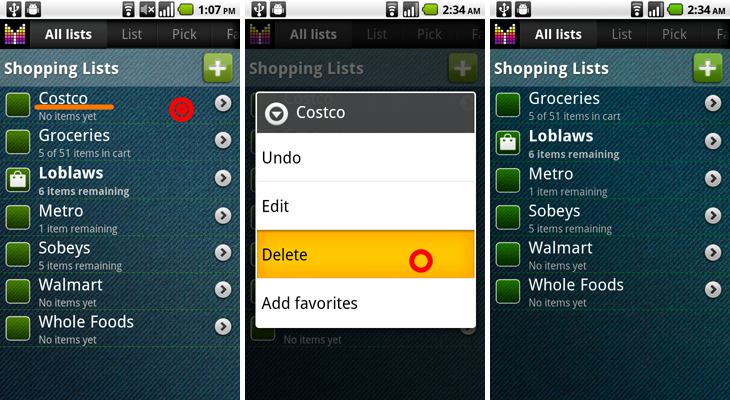 Once Favorites list is populated, you just tap items you need and they go to your shopping list. Then you check items you put in cart and once you’re done you tap Checkout to clear items from shopping list and save them in History. 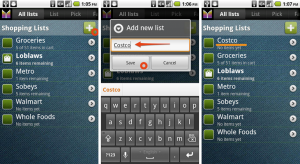 You may also consider Pick list as a source of items for your shopping list. As for the other two suggestions, we may consider them going forward.